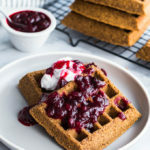 Gingerbread Waffles are hearty and wholesome, made with steel-cut oats, whole wheat flour and all the warming spices of the season! Serve with coconut whip for an added breakfast treat! Add the berries, sugar and orange zest and juice to a small saucepan. Bring to a low boil and let simmer until the berries have softened and the mixture starts to thicken. This will only take about 10 minutes. Be sure to stir often so the berries do not burn. Once the oats are soaked, pre-heat the oven to 400F and grease a 6-waffle silicone mold. (I also place the mold on a baking sheet for stability). In a medium-sized bowl, whisk together the eggs, oil and molasses. Add the oat mixture and stir until combined. In another medium-sized bowl, whisk together the flour, sugar, baking powder, ginger, cinnamon, salt, cloves and nutmeg. Add the wet mixture to the dry ingredients and stir until well combined. Pour the batter into the silicone mold using a spoon to spread it out evenly. (The batter will be thick). Bake for 14-16 minutes, or until the waffles are browned and firm. Remove from oven and let cool in the mold for five minutes before turning the waffles out onto a wire rack to cool slightly before serving. Serve warm with partridgeberry compote and coconut whip. Store any leftover waffles (without the compote and coconut whip) in an airtight container on your counter for 1-2 days, or freeze for later enjoyment. If you don’t have partridgeberries, fresh or frozen cranberries are a great substitute. To make coconut whip, refrigerate a can of coconut milk for at least 24 hours. In a deep mixing bowl, scoop out the solidified coconut milk, and using an electric mixer, beat on high for a few minutes until the milk is fully whipped.